We are a registered company and will be applying in the near future for Hope after Suicide Loss to be registered as a charity in England and Wales. Revd Canon Chris Copsey and Vicki Chapman are currently directors of Hope after Suicide Loss, but have already volunteered to be Trustees on the Board of Trustees once HOPE achieves charity status. As trustees, they will be responsible for the future charity’s values ethos, vision and strategy as well as ensuring legal requirements are met, and governance standards remain high. I was born and bred in Suffolk although I did live for a brief time in Hampshire and for several years in Derbyshire. When my first husband and I divorced the decision was made to return to my roots and I now live in the historical town of Bury St Edmunds. In recent years I has been heavily involved in providing a peer led flexible service for suicide loss in Suffolk. But in the past I would have described myself as a stay at home mum dividing my time between children, home and supporting my late husband in his business. Outside of work I have a lifelong love of history particularly World War One, the Tudor period and researching my family tree. I value the support of good friends and my children and grandchildren live nearby. Most definitely my guilty pleasure is my two indoor cats, Miss Lilly a cream British shorthaired and Dolly Mixture a first cross, Ragdoll, Persian. In June 2009 my life changed forever when I returned home and found my husband had taken his life. It was then I tested the system and found all I was offered in Suffolk was time-limited therapy often delivered by general bereavement organisations. Late 2011, I launched a service in Suffolk under the national charity SoBS and became their county facilitator. Structured, peer-led groups in Bury St Edmunds, Ipswich and Lowestoft followed. I made the difficult decision to step down from SoBS in January 2019 to focus on my vision with HOPE of a much-needed service for suicide loss in both Norfolk and Suffolk. Vicki is a true East Anglian, having been born in Ipswich and lived in Suffolk all her life. A farmer’s daughter, Vicki left her agricultural roots behind to work in the insurance industry for Willis Towers Watson (both in Ipswich and London), where she has remained for almost 40 years. In her day-to-day role, Vicki deals with charity and corporate social responsibility – an area that her company is focusing on more and more. 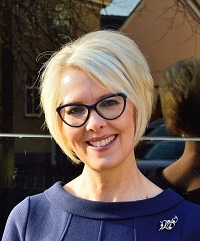 In addition to her day job, Vicki is a Council Member for the Chartered Insurance Institute of Ipswich, Suffolk and North Essex – which keeps her very busy! Her farming roots have instilled a love and awareness of the countryside and Vicki is at her happiest walking her dog around the many footpaths in her village and watching the seasons change. She enjoys road running and has completed the Great North Run 9 times, she is hoping to complete her 10th half marathon in 2019 when she takes on the Great East Run! Classic cars are another passion and her ambition is to buy herself a Morgan when she retires and to re-visit her love for art, drawing and painting; which she has largely abandoned since she left school. Vicki’s husband of 32 years, tragically took his own life in February 2014, so she is a suicide survivor herself; and has experienced first-hand the trauma and shock of suicide bereavement and the impact it has on those that are left behind. In becoming a Trustee of Hope After Suicide Loss, Vicki hopes that she can go some way to help other suicide survivors on their challenging journey. Chris has been a primary school teacher, Parish Councillor and Chairman of Governors for a large infant and nursery school and is Mum to three adult children and has 5 young granddaughters. Before ordination as an Anglican Self Supporting Minister in 2007 she was a Reader for 9 years across 7 rural parishes. Her curacy at St Margaret’s, now the Minster, in King’s Lynn gave a wide variety to ministry and she continues as part of the ministry team. Chris was Chaplain to Norfolk County Council from 2007-2014, before moving to a chaplaincy with the Matthew Project for 3 years. In 2011 Chris was licensed by the Bishop of Norwich as Chaplain to the Norfolk Coroner, a unique chaplaincy in the UK. She provides pastoral care to those attending inquests particularly families. Chris is a member of the Norfolk Prevention of suicide Strategy Group and the Norfolk Suicide Support Group. She arranges an annual service of remembrance for those bereaved by suicide at Norwich Cathedral and Kings Lynn Minster. Chris is also Diocesan Coordinator for the Social, Community and Environmental Concerns Forum and the Ecumenical Criminal Justice Forum and a Board Member of Good Work, The Norfolk and Waveney Industrial Mission. She was installed as an Honorary Canon of Norwich Cathedral in November 2017.